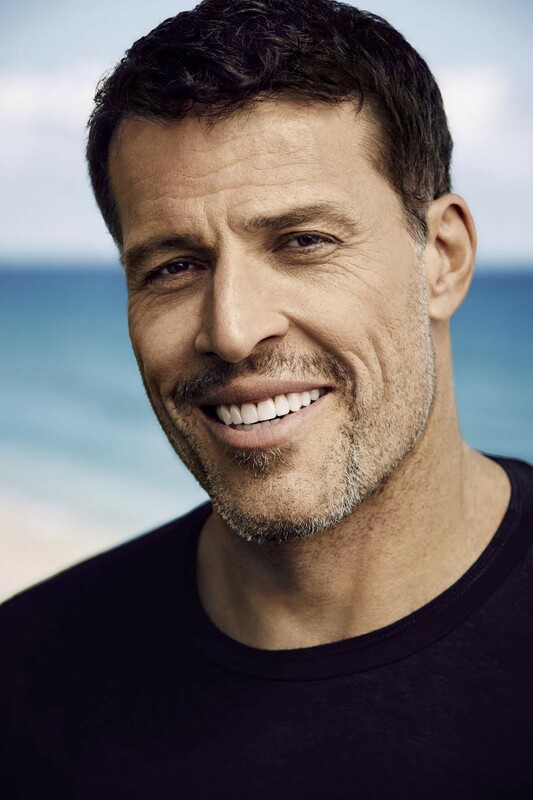 Tony Robbins: The very first thing I do is I go jump into 56-degree freezing water in a cold plunge. It’s an ongoing discipline I’ve created for myself. I don’t negotiate with my mind, I tell my mind what to do and it does it. Part of that is I developed this simple discipline because I don’t feel like going in that water, and in fact I have these cold plunges in all my homes. In my home in Sun Valley, Idaho, in the mountains there, there’s a river that runs through it, and when I’m there in the winter, the water can be 34–35 degrees, just above freezing, and I do the same thing. I dive in. I do it both as a mental discipline, and also because it stimulates the blood flow of the lymph nodes and the body. You feel fully alive. So it’s just a daily discipline. And then I do a minimum of 10 minutes of what I call “priming.” Priming is a process where I alter my state by making some radical changes in my breathing instead of [the regular] breathing patterns I do, and then I do three things for 3 1/3 minutes each: I focus on three moments in my life that I’m grateful for, because gratitude is the antidote to the things that mess us up. You can’t be angry and grateful simultaneously. You can’t be fearful and grateful simultaneously. So, gratitude is the solution to both anger and fear, and instead of just acting grateful, I think of specific situations that I’m grateful for, little ones and big ones. I do it every single day, and I step into those moments and I feel the gratitude and the aliveness. Then I do a 3-minute blessing and prayer for my own body’s health and for all the people in my life. I do a circle of prayer of my family, my friends, my close business associates, my clients, anyone I’m going to meet. And then the last 3 minutes of what I call “3 to thrive” where I focus on 3 results, 3 outcomes that I want to accomplish, and I see them, and feel them, and experience them as done, and I feel grateful for them. And that little 10 minute warm-up I do because I really believe that if you don’t have 10 minutes for yourself, you don’t have a life. Most of us think we control our own thoughts. Many of our thoughts are primed; they’re triggered by our environment. So I don’t get up hoping things will go well, I radically alter my body, I take charge of my mind, and then I do this priming as the first steps to begin my day. TR: My mission. Making a difference in any measurable way grabs me. Seeing people overcome a giant obstacle or challenge, seeing people lit up, seeing people remembering who they truly are, it’s what drove me from the earliest days in my career and continues to drive me today. I’m fortunate enough to never have to work again, but I work harder than I ever have just because I get so much energy from seeing the impact on people’s lives as they do everything from double the size of their business, to lose 50 pounds, to find or create the relationship or desire to transform their body. It doesn’t matter the subject, it gets me up and it gives me energy. It’s a cycle: The more energy I have, the more energy I have to give. TR: As little as possible. I have 31 companies in 7 different categories around the world. We have 1,200 employees. If I let email dominate me, it would dominate me completely. I focus on what’s most important and I do it a couple ways. One is we use Slack and Chatter in some of our companies so that the conversations are more fluid and natural, and they’re with the right people in the right moment in time, and it cuts down all the excesses of emails and all the copying on emails with all the people CC’ing it. So anything that’s internal in those companies is on those platforms. There’s no email. I won’t accept email from people in my own companies unless there’s a really good reason for it. We’ve eliminated it for all internal communications. And then external email, I use texting more often because it’s similar and brief. If a conversation is going to be a long email, I’d rather pick up the phone and just resolve it. And I use email in some cases for the outside world, more likely text or Slack, to set up a time for us to touch base on the phone to solve things 1 time. My own emails I have organized by my assistants, they go through and chunk them based on categories. And they have to deal with both urgent and important, but also I have categories related to my family, categories related to the various companies I have, categories related to media, and so I don’t get things in a random order the way email provides it. I get it organized in chunks and brought to me in a way that I can focus on the things that relate to one another and solve them all at one time.